If you or any of your colleagues are going to NeoCon next month, you might be interested in attending my presentation, "Stragegic Planning for Healthier Indoor Environments." 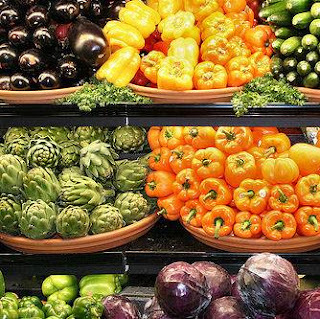 If you are wondering why I'll be starting my talk with this lovely photograph of fresh vegetables, it's because people will pay a considerable premium for healthy, organic food. Although Whole Foods seems to spend a fortune on prime real estate and beautiful decor, it is three times more profitable than the average supermarket chain. Of course, we breathe considerably more than we eat. And indoor air usually contains a lot of toxins, many of which can be easily avoided by proper design and construction.